The good news is that many safari companies in southern Africa will welcome your little cubs with open arms — and they won’t feed them to the big cats. Choosing where to go throws up endless options. Do you visit the great plains of the Serengeti, the wetlands of Botswana, or the 19.5 sq km Kruger National Park, on the border between South Africa and Mozambique? I have an interest in the plight of the rhino, and 6,000-7,000 of them live in Kruger. Sadly, 421 of these gentle giants were killed by poachers last year, according to South Africa’s Department for Environmental Affairs, compared with just 13 in 2007. If nothing is done to stop this senseless slaughter, both black and white rhino risk becoming extinct in the wild. With that horrific thought in my mind, I decided I wanted my daughter to see these majestic animals in their own habitat — before it was too late. We flew to Johannesburg and stayed for two nights to recover from the journey. Romi loves plane spotting and, as luck would have it, our hotel, the Protea, was beside the airport — and the A380 double-decker superjumbo that we flew in on. Instead of visiting Mbombela, formerly Nelspruit, a city popular with tourists and a gateway to the park, we headed to Hoedspruit in the northern province of Limpopo — a six- to seven-hour drive from Johannesburg. Rather than drive long distances alone with Romi, I booked a shuttle bus from Ashtons tours, which runs a twice-daily service and was highly recommended. The roads here are dangerous, as people and wild animals cross randomly. Many drivers do not have lights, insurance or even a driver’s licence, so if you are planning a self-drive, have a chat with the locals first about the best routes, and avoid driving at night. At the foothills of the Drakensberg mountains, Hoedspruit had just a few lodges 20 years ago. Now, it has more than 300, with many on the privately owned game reserves on the edge of the Kruger. The host at our first stop, Twiga Towers, a B&B, took us on an unexpected mini game drive in his car. We saw a black mamba, one of the most feared snakes in Africa, as well as giraffes, impalas and vultures. It was a lovely start to the trip. The next day we were picked up by a driver from Khaya Ndlovu Manor House, a glamorous private lodge close to Hoedspruit town. The manor house is in the Khaya Ndlovu game reserve, and has a pool, plus breathtaking views of the Blyde River Canyon, the third-largest canyon in the world. We took a boat tour along the river that afternoon. 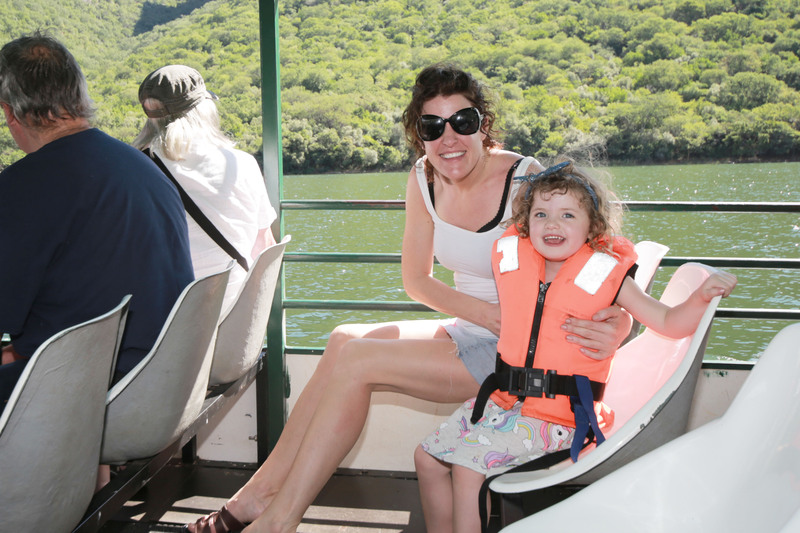 As I had found out the hard way, four is the youngest age at which boat tours start being fun, and we were both able to enjoy the majesty of our surroundings. Most lodges offer safaris at dawn and dusk, and we left at about 5.30am, after coffee. There would be more stops along the way for drinks and snacks. Early tours finish about 9am, after which you can tuck into a hearty breakfast and relax by the pool, or go for a bush walk in the lodge’s garden. Afternoon safaris run from 4.30pm to 8pm. Not all lodges accept children, especially those under the age of six, and if you have a toddler or a child who is particularly energetic, I would suggest doing something else. Game drives last three to four hours and take you just metres away from dangerous animals, so you cannot stand up, make sudden movements or get out of the car (“Yes, people actually do that,” said a guide). I was also told that lions do not like high-pitched baby noises. There are up to three guides per game drive, who make you feel at ease. I never once felt unsafe, even when a lion was close to the car. Romi loved the drives and we went on eight; each was different, but they all filled us with excitement and expectation. All you need with you is a sweater, in case it gets cold, and a camera with a long lens, but there was room for my daughter’s Barbie and her favourite teddy. I learnt from the guides that it is important not to tag locations or post photographs of endangered animals on social media, because this makes life easy for the poachers. Jordan and other concerned citizens formed Rhino Revolution to combat poaching, rehabilitate animals and educate communities. Romi and I visited its rehabilitation centre, beside the Khaya lodge, and watched a video of a rhino being dehorned. “Well, it’s because rich people in Vietnam snort crushed rhino horn after dinner, when they feel full, even though its made of keratin, rendering it useless,” I replied. It made no sense to a four-year-old, either. After two days at the Khaya lodge, we transferred to nDzuti camp in the Maseke reserve, about 40 minutes from Hoedspruit. The camp is run by bush experts Bruce and Judy Meeser, who have been living in the bush for 40 years and were fundamental in transforming Hoedspruit into what it is today. The camp had a relaxed vibe and, most important, a lovely pool, so we swam between game drives and food. We went out in the bush in the afternoon of our arrival and spotted an elephant by a lake, and more lions. “You never get tired of it,” said our guide, Lucia. I spent the rest of the week trying to figure out how I could live in the bush and go on game drives every day. We stayed in a beautiful tented chalet, and I felt like Bear Grylls because I ended up using the two lamps I had brought with me to find the chalet at night, even though torches were provided. It goes without saying that a trip to Africa requires a great deal of preparation, especially when it comes to vaccines. As I am not a conspiracy theorist with zero medical credentials, I had jabs for flu, hepatitis B and A and typhoid, and was given malaria tablets. My daughter was given paediatric hepatitis A and typhoid vaccinations, plus paediatric anti-malaria tablets, although malaria is rare. The Malarone tablets have to be taken for seven days after you arrive home, but they gave me peace of mind. I also had a tetanus booster, as did my daughter, so we are good for 10 years. In the evenings, dinner was served in various spots around the camp. A guide sat with us during the meal, and both Romi and I learnt about the region and its animals. For example, I discovered that vultures can fly to a height of 2,987 metres, hyenas are matriarchal and a bite from a black mamba can kill you in 20 minutes. Romi had been scared of dung beetles, but when she saw Lucia rescuing them from the pool, she wanted to save them, too. It was a beautiful moment. Every child should be able to spend this much time in nature, with no phones. It is the best gift a parent can give. Leaving the bush was hard. We did not want to go back to traffic, social media and endless talk about Brexit. Going on safari is not cheap, but it is an incredible opportunity to switch off, learn about wildlife, bond with your child and become more aware of the conservation efforts taking place in Africa. I can’t wait to do it all again. I guess what they say is true — once you have a taste for the African wilderness, it will call you back. Safari arrangements: Most lodges offer drives in their reserve and often to Kruger. Specialist companies organise drives to the Kruger and beyond. Check their policy for children in advance. Tipping: Tip the guides and staff. Transfers: Lodges arrange transfers, at a cost. Next articleChocolate is racist- whatever next? Holidays with kids and booze..